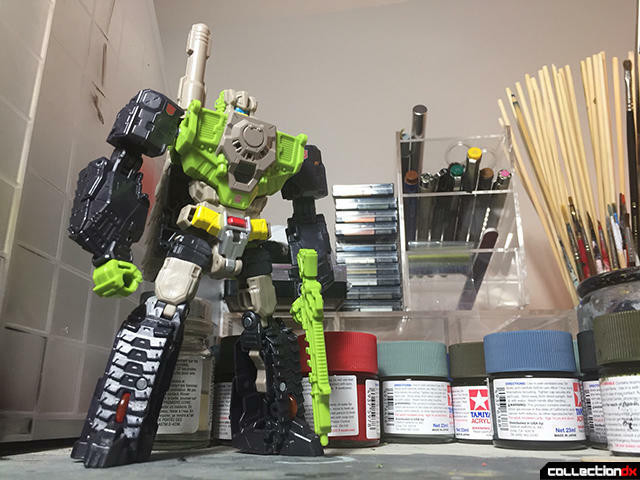 Hardhead was attempted as a Classic's style figure before as a repaint of onslaught in 2009 but, I held off on getting it when it was in stores. 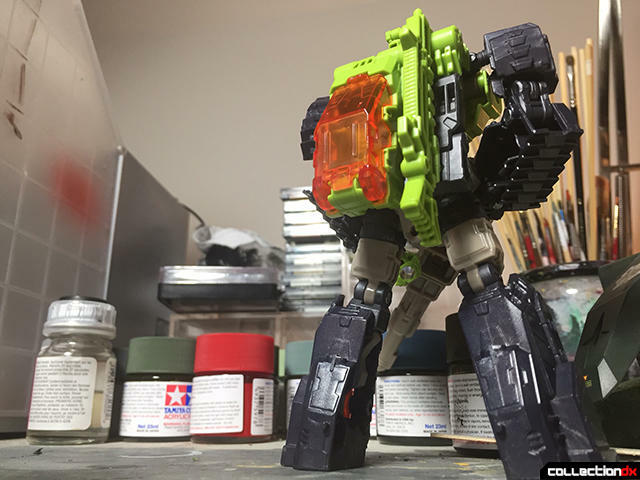 Years later, I'm glad I never paid $25 for it back then because now, a proper, and quite great Hardhead figure finally got released. 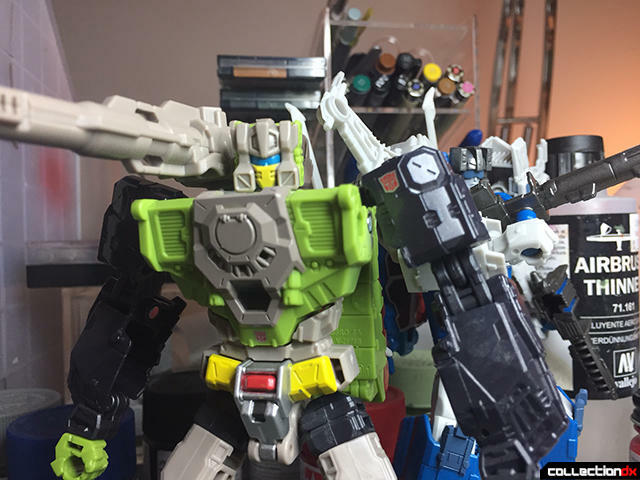 In robot mode, Hardhead looks very striking and perfectly imposing but, he's also so faithful to the g1 figure, that's all I really need to say! 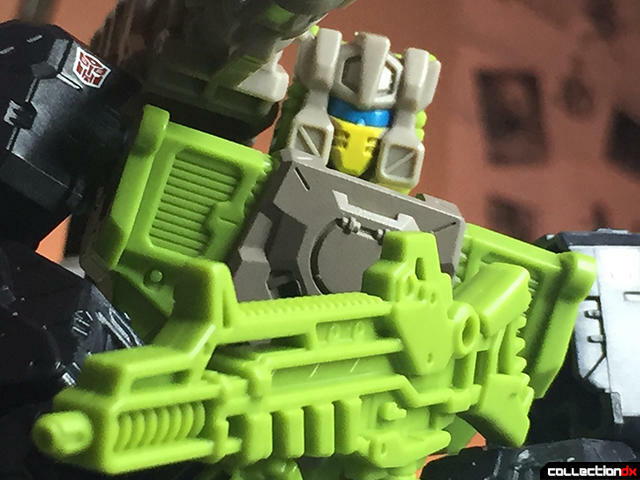 The construction is solid and flawless, proportions are pretty deace, and the articulation goes one step further than most deluxes of late, as Hardhead has both a wrist swivel and, proper double jointed elbows! 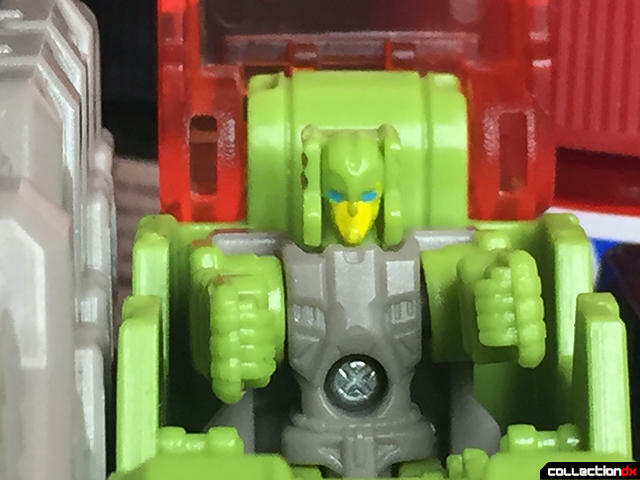 Hardhead's Titan Master actually looks really good as well considering his fully painted, really tiny face! Accessories are really great, and interact with other Titan Masters better than any other wave 1 deluxe! First, is his versatile machine gun rendered in green plastic. He can hold it very securely, and it's a perfect sidearm when accompanied by his huge cannon, that can be mounted on his shoulder or, held in his hands! 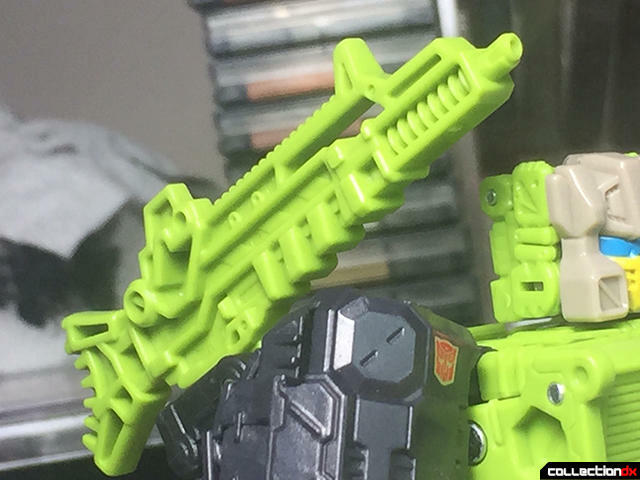 The cannon can also open up at it's base to reveal a seat for other Titan Masters! Lastly, the machine gun can be placed on the same shoulder mount as the cannon or, both weapons can be combined together but, I'll show those features when we get to vehicle mode. Hardhead is about the same size as his fellow headmaster colleagues, namely Highbrow. 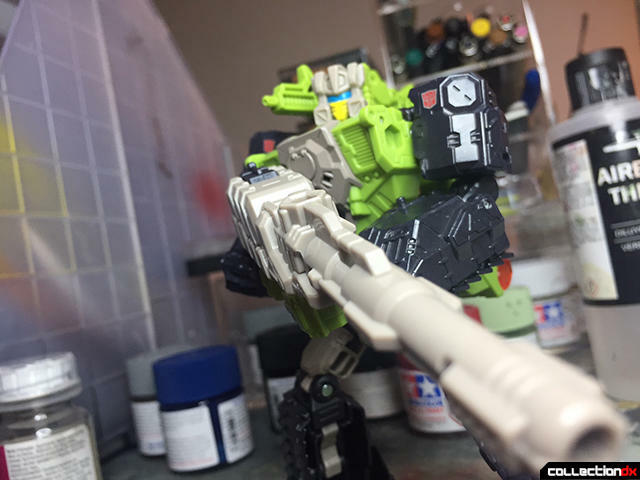 Transformation on Hardhead is just perfectly fun to execute. It's simple sure, but everything tabs in and locks tightly in a way the is super simplistic but really satisfying! 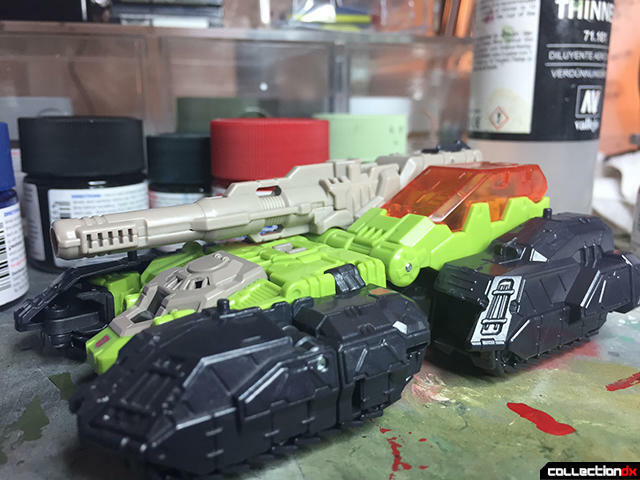 After a perfectly good transformation, it's great we get a perfectly good vehicle mode to match! 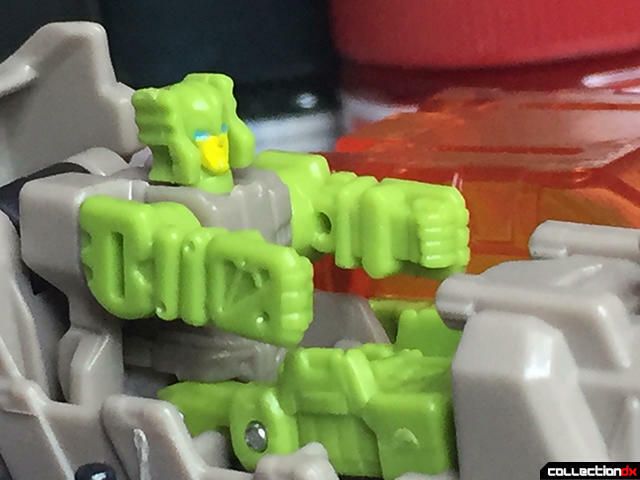 Like I said, this H tank is solidly constructed, and doesn't look like it's just Hardhead lying down! Titan Master integration is spot on as, everything that could be done with the accessories in robot mode can be done here! The Titan Master can also sit in the side mounted cockpit with a very eye catching translucent orange windshield. 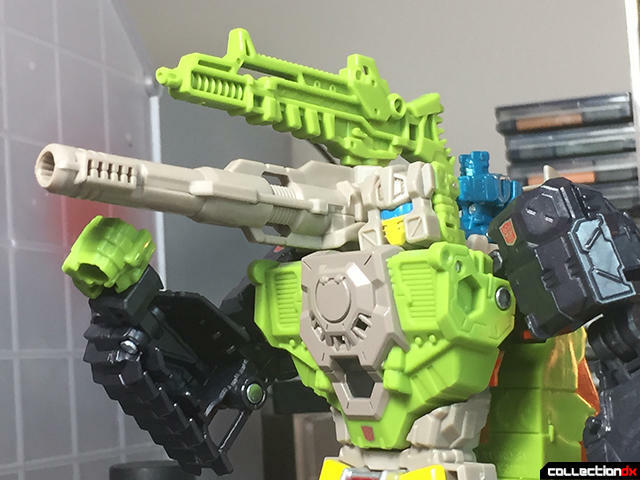 Taking everything into account, Hardhead is as good as Titans Return figures can get! Everything from his awesome design to the simple but perfect transformation, articulation, and accessories! Do yourself a big favor, and get this figure NOW!